A woman dressed up as elven princess Firiona Vie stood off to the side looking uncomfortable at Sony Online Entertainment's private CES unveiling of the EverQuest: The 10th Anniversary Collector's Edition book cover. Yes, Everquest is 10 years old, and Sony Online Entertainment is celebrating their baby with a massive hardcover book detailing the rise and leveling off of their biggest, brightest MMO star. At a private event held at CES, the company presented the cover art for EverQuest: The 10th Anniversary Collector's Edition, a gorgeous piece of work created by master artist Donato Giancola. Meanwhile, Firiona Vie stood to the right, possibly hoping that no one who knew her would ever see this picture. It's actually a rather nice costume, and the book sounds interesting as well. Just not quite as interesting. It'll be available later this year from BradyGames for $49.99. LAS VEGAS, Nev. - Jan. 9, 2008 - It has been a decade since Sony Online Entertainment LLC (SOE) rewrote the rules and forever changed the video game industry with its massively multiplayer online game, EverQuest®. To celebrate the historic milestone, today SOE held a private event at the Consumer Electronics Show to unveil the exclusive cover art being used for an upcoming book that recounts how the story of Norrath became a global phenomenon and attracted millions of players. The art for EverQuest: The 10th Anniversary Collector's Edition, created by master artist Donato Giancola, shows iconic elf princess Firiona Vie leading a band of adventurers into battle against an evil wizard and his enormous dragon ally in the Swamp of No Hope. "We are thrilled that a talented artist such as Donato has created an exclusive masterpiece in honor of the celebration of the EQ legacy," said John Smedley, president of Sony Online Entertainment. "The cover brings together a special selection of EverQuest artwork and documents the quintessence of an intensive creative process over the last decade." EverQuest: The 10th Anniversary Collector's Edition celebrates EverQuest's legacy by taking a look at the past, present and future of the brand. The book, written by veteran video game book author Rusel DeMaria, includes essays and photographs of the events, products, personalities and art that graced the world of Norrath over the years. Rich in vivid detail, each page will help tell the story of the evolution and its place in our culture. 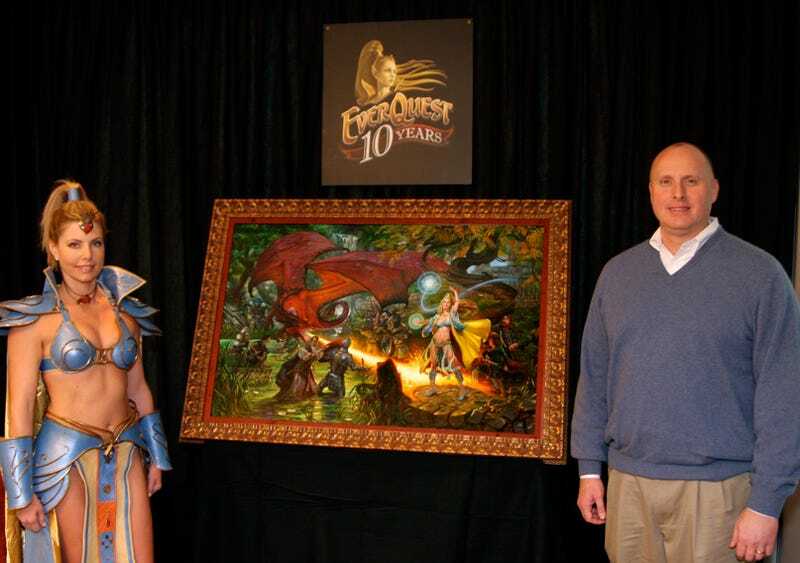 SOE will also hold special events around the country in honor of the 10th Anniversary of EverQuest throughout 2009. The book, published by BradyGames, will be available for purchase online and at select retailers in North America later this year for a suggested retail price of $49.99. Pre-orders are available at www.bradygames.com/everquest10. Donato Giancola balances modern abstract concepts with realism in his paintings to bridge the worlds of figurative and non-representational arts. From "The Lord of the Rings" to Gericault's "Raft of the Medusa," Donato's influences encompass visits to the local game shops and pilgrimages to the greatest of museums. Donato recognizes the significant cultural role played by visual art and makes personal efforts to contribute to the expansion and appreciation of the science fiction and fantasy genre that extend beyond the commercial commissions of his clients. To those ends, the artist teaches at the School of Visual Arts in New York City and appears at various institutions, tournaments and conventions, from San Diego to Rome to Moscow, where he performs demonstrations in oil paint and lectures on his aesthetics. Rusel DeMaria is the author or coauthor of more than 60 books, most of them in the gaming field, including Myst: The Official Strategy Guide, which sold more than 1.2 million copies, as well as one of the most comprehensive histories of the industry, High Score! : The Illustrated History of Electronic Games. He founded and served as creative director for the most successful strategy guide publishing imprint in the industry and is a former senior editor and columnist for several national video game magazines. entertainment for the personal computer, online, game console and wireless markets. Known for its blockbuster franchises and hit titles including EverQuest®, EverQuest® II, Champions of Norrath®, Untold Legends™ and PlanetSide®, as well as for developing Star Wars Galaxies™, SOE continues to redefine the business of online gaming and the creation of active player communities while introducing new genres on various entertainment platforms. Headquartered in San Diego, CA, with additional development studios in Austin, TX, Seattle, WA, Denver, CO, and Taiwan, SOE has an array of cutting-edge games in development. SOE, the SOE logo, EverQuest and PlanetSide are registered trademarks of Sony Online Entertainment LLC. Untold Legends and Legends of Norrath are trademarks of Sony Online Entertainment LLC. All other trademarks and trade names are properties of their respective owners.